Unless you can travel to sunnier states during the winter season, there’s a good chance your time on the green will dwindle during the off-season. But as the team at Eastlyn Golf Course & The Greenview Inn explains, taking a hiatus from the game can undermine the hard practice you gained over the previous year. Fortunately, bad weather and cold temps don’t have to be the end of your golfing ability. To help you stay golf-fit during the off-season, consider these tips. Specialized medicine ball throws, pushups, and core routines are among the many workouts that can build strength and improve swing performance. Also, perform exercises and stretches that enhance mobility, especially those that focus on hip rotation. If you’re enjoying a cozy winter day by the fireplace, pick up a few pro golfing books. While these texts may not offer the interactive components of actual practice, they may introduce you to new concepts and strategies to keep your head in the game. Don’t overlook opportunities to get out on the golf course when holiday vacations or business trips bring you to warmer climates. Although it may not be your ideal set up and you may not have your personal set of clubs, practice prevents your skills from getting stale. If you’re homebound for the winter, take up lessons at an indoor facility. Practicing your swing in front of a trained instructor gives you the unique opportunity to refine your form and step up your abilities in the next season. There are many training tools on the market that are indoor-friendly. For example, golf swing trainers are weighted rods designed to help you improve your tempo and build strength. Consider also an indoor putting track to add precision to your final shots. Or, if you’re looking for a visual learning tool, purchase a golf simulation program designed to work with your home computer. 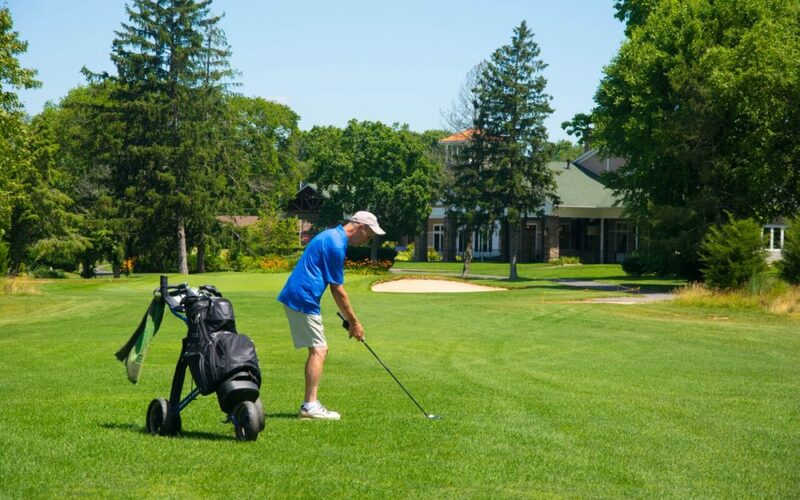 When you’re ready to show off your skills in the spring, you can delight in the amenities offered by Eastlyn Golf Course & The Greenview Inn. We are an 18-hole par-62 golf course that is ideal for players of various levels and equipped with top amenities to make your game more enjoyable, including electric carts, club rentals, and putting greens. For questions about membership, lessons, reservations, or wedding rentals call (856) 691-5558 ext. 1 today.